After a volatile week the markets could be poised for further gains. As always, the market picture we see as of Friday's close is rarely the market we get at Monday's open. This time we could be poised to continue the gains from last week. If it were not for the Apple warning and the -644 point drop on Thursday we could have been a lot higher today. That drop was erased but it still damaged sentiment. Everyone was starting to add to their bullish positions only to have the market hit their stop losses only a few hours later. 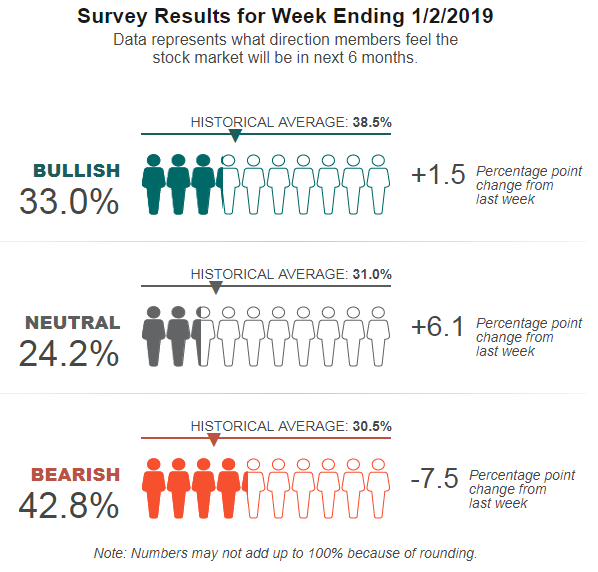 Because the AAII sentiment survey ends on Wednesday, the impact from the Apple announcement is not yet factored into the puzzle. 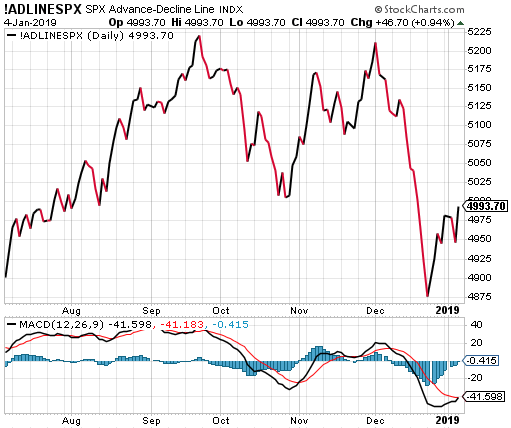 After the first couple days of 2019 bearish sentiment was already plunging. If we can squeeze out even a minor gain on Monday after the 747-point Dow gain on Friday, we should see a big change in sentiment next week. This is going to be a short Index Wrap this week because all the charts look the same. There is a rally in progress and everything is in rebound mode but still uneasy. The increased volatility, even if it is positive, is still a major uncertainty factor. 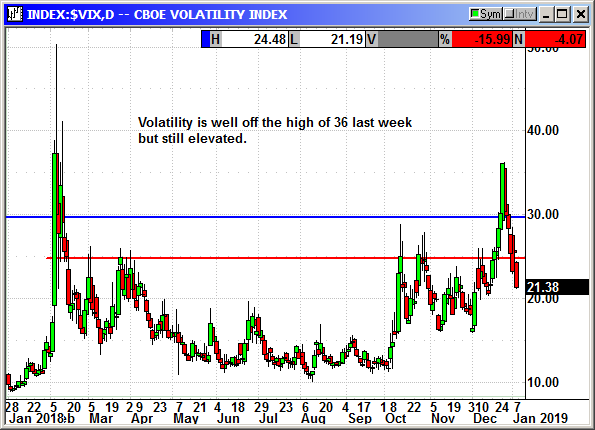 The VIX has fallen 15 points since the December 26th high at 36.20. That is a major decline and it fell -4 points on Friday thanks to the big market rally. Even though it is falling, it is still a factor for investors. The Nasdaq was the biggest gainer on Friday at a whopping 4.26% but it remains more than 500 points in correction territory. The A/D line improved significantly but there is a long way to go here as well. The MACD has turned positive but we need a week of uninterrupted gains to really heal the market. The S&P AD has also rebounded sharply but the Apple impact from Thursday was clearly visible. This is a good start to a rebound, but we have a long way to go. 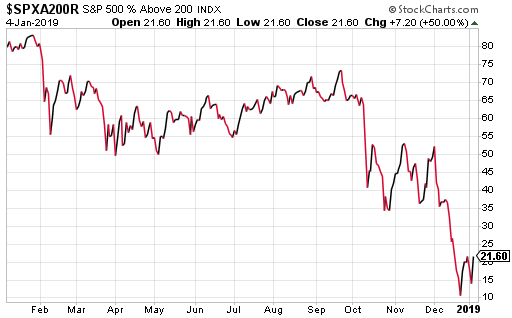 As an indication of just how far we have to go, the percentage of S&P stocks over their 50-day average rose only slightly to 11.8%. That is still very oversold when we have averaged 60% or more for most of the summer. The percentage over their 200-day is only slightly better at 21.6%. 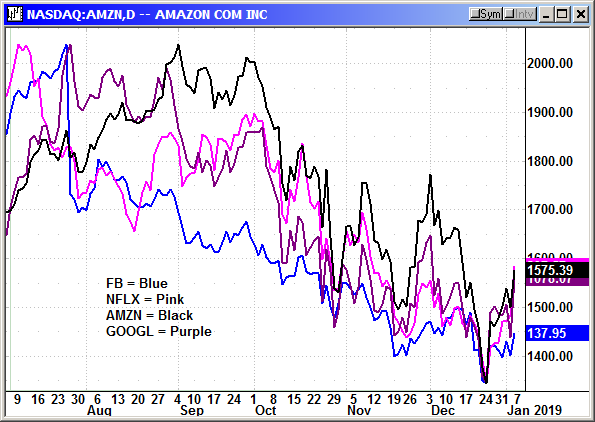 The Nasdaq got help from the FANG stocks with all rebounding strongly. Facebook was the laggard, but it still managed a $6 gain on Friday. The FANG trade may not be dead, but we need a replacement for Facebook. The chip sector was remarkably in tune with the Nasdaq over the last two weeks. They have been in lock step. I would expect the chip stocks to lead the Nasdaq higher this week. With the Apple scare over, the oversold chip sector should find some buyers. 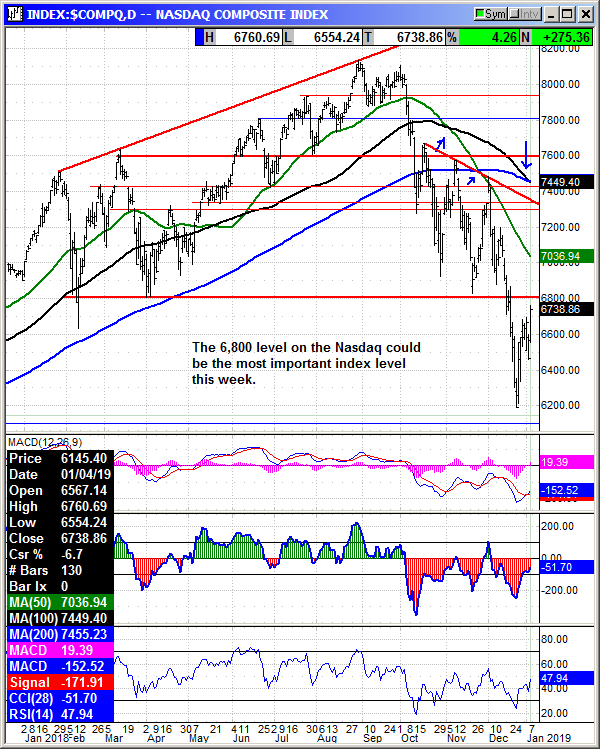 The Nasdaq is the key index for next week. It has decent resistance at 6,800 and again at 7,300. The 50-day at 7,000 could also be a problem. 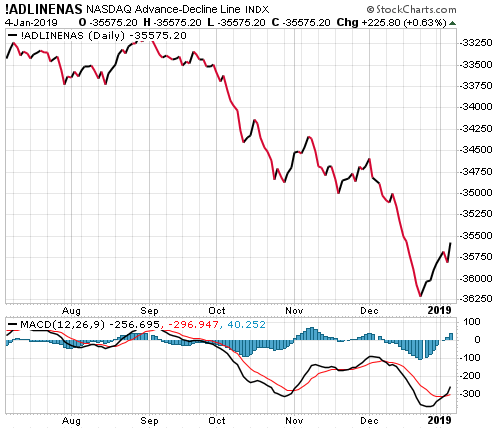 The Nasdaq was the most oversold index and "should" rebound the strongest. We need to see 7,400 or higher before we really start celebrating. Tech earnings should be good and assuming the first few reports are positive, we could see another surge. Investors like tech stocks in any rally and the Nasdaq could lead us out of the December disaster. 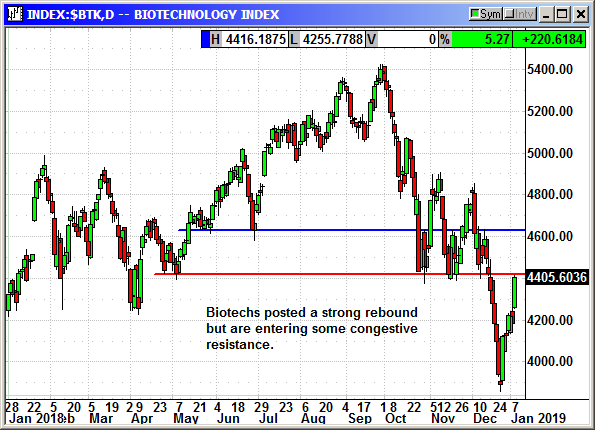 The biotech sector rebounded sharply thanks to the Celgene acquisition news. The index has rebounded back to resistance at 4415 and this could be a challenge in the weeks ahead. 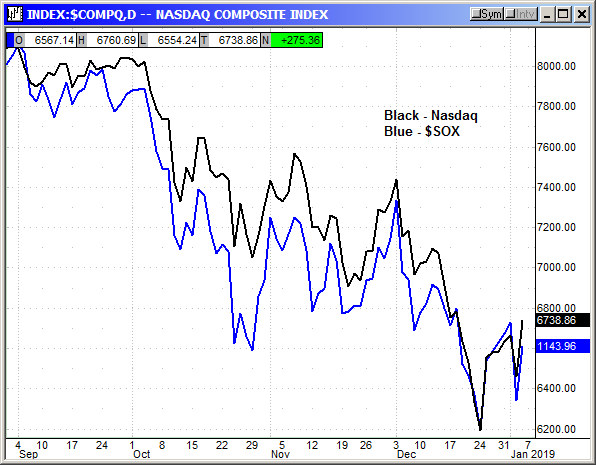 The sector is not likely to be a positive factor for the Nasdaq next week. I would recommend buying the dips. Option premiums have inflated despite the decline in the VIX. Look for small bouts of profit taking and try to add some oversold stocks with a good outlook. There will still be volatility, but very oversold stocks should be mostly immune. Their damage is behind them. 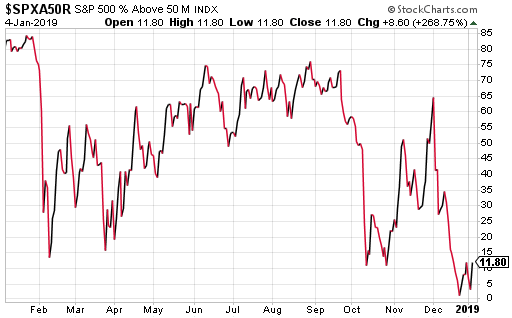 Stocks that have rebounded sharply from the December bottom could struggle to move higher.